Every risotto recipe I’ve ever made yielded a lot of risotto. A lot. Since it’s just my husband and me in our household, that means there’s always leftovers. But leftover risotto is kind of an abomination. It’s never as creamy as the first day you make it and it’s just kind of off and disappointing and even a little bit depressing. So here’s what you need to do when you have leftover risotto: you need to make baked arancini. Traditionally, arancini is fried in a skillet or deep-fryer. But risotto is a little on the heavy side, so adding even more fat from frying isn’t the best idea. Arancini is often stuffed with cheese too, but I’ve omitted this as well. That doesn’t mean this baked arancini is healthy, but it’s a little more virtuous than its deep-fried, cheese-stuffed counterpart. Done correctly, baked arancini has the same crunchy exterior and creamy interior as the fried variety, without the greasiness. 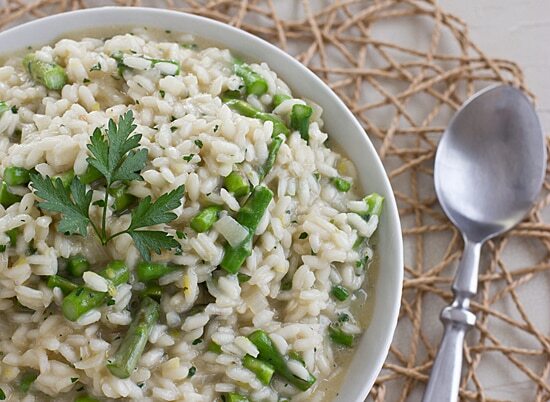 The beauty of this recipe is that you can make it with any leftover risotto you have on hand. You can form the arancini into smaller balls and serve them as an appetizer or use them as an entree or side dish. Arancini is versatile like that! I like to serve mine with marinara sauce, but last week How To Ice A Cake one-upped me by posting recipes for Arancini Salad and Arancini Grilled Cheese–see what I mean about arancini’s versatility? So next time you have leftover risotto, for the love of all things holy, don’t microwave it and eat it as is. Make this easy baked arancini instead. 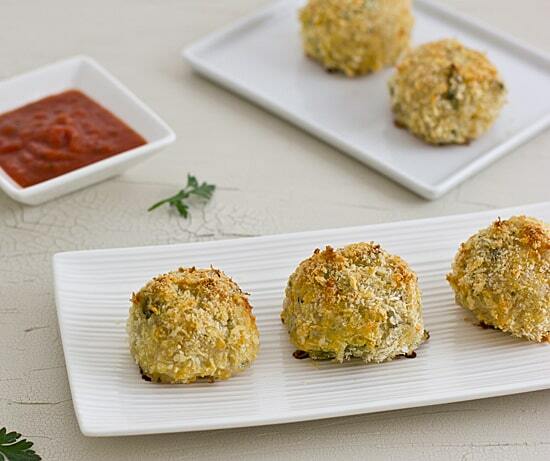 Baked Arancini is the perfect way to use leftover risotto! Adapted from Oven Baked Arancini. Preheat oven to 425 degrees. Put flour and panko onto two plates and spray a rimmed baking sheet with olive oil. Roll risotto into 1/4 cup-sized balls. Coat with flour, then egg, and roll in panko until completely coated. Transfer arancini to baking sheet and spray with additional olive oil, being sure to coat all sides as best as you can. Bake for 25 minutes, or until golden and heated through. Serve with warm marinara sauce. I just made arancini not too long ago to see if it could match the Trader Joe’s version I used to buy. Note I said USED to buy! 🙂 Something satisfying about making one of your favorite store bought items yourself. Just scrumptious! You are always so inspiring. I have to try this. It looks delicious! I hope you like it if you make it–it’s a nice way to get two meals out of one dish! omg…that looks so delicious. Never tried arancini – they look so good even baked! I had never had arancini until a few years ago, and now they seem to be popping up everywhere! Usually restaurants fry them, though, which is why I prefer homemade baked arancini instead. They look amazing, perfect actually, and so much better than fried. Great idea to bake! Yummmmmm! I have the same problem with some dishes. It’s just Hubz and me, so most things I cook are dinner one evening, then lunch another day. But some things just don’t do as well as leftovers. This is a great idea for extending a dish! We used to have leftovers for lunch, but lately we’ve been having them for dinner instead. I don’t mind it, but it’s prompting me to get more creative with our leftovers because you’re right, some things just don’t reheat very well! Thank you! I always have leftover risotto but frying it is too much of an indulgence. This is perfect! I have never heard of these, but they look and sound delicious! If you’ve ever made patties out of rice, egg, etc., arancini is kind of like that, except they’re round and a little bit softer inside. I can’t believe I’ve missed your lemony asparagus risotto. I’ve got to go back and find this. I made risotto cakes once with a lemon risotto and loved them. Arancini is amazing and I’m sure it’s even more amazing made with leftovers from that particular risotto. I love that you’ve baked these instead of fried them. I always bake things instead of frying them (mostly because I just know I’ll end up with oil splashing all over me should I attempt to deep fry something), but I’m usually of the opinion that the fried version has a better texture–you rarely get that perfect crunchy exterior when you bake. But these arancini were very close to the fried version–the only difference was that they didn’t have all that excess oil! I don’t fry anything either; but, I’ve found that panko makes that much easier and much more enjoyable thanks to the crispy nature of it. By the way, I just had my morning mango oatmeal with your suggestion of crystallized ginger and loved it. Thanks for that suggestion! It made it even more interesting with that addition. The Trader Joe’s ones are really good–I think they’re stuffed with cheese so they’re a wee bit on the heavy side, although they are delicious. I don’t make risotto often but when I do, I also end up with lots of leftovers – I’ve never thought of actually doing something creative with them though! It’s so nice to have a baked version of risotto balls for the next time I have some leftover risotto! I’ve never heard of Arancini before, but yours looks like a work of art. 🙂 I’ve been wanting to make a spring risotto too. This could be a cool way to use up some of the leftovers. I think the first time I heard of arancini was when I saw it at Trader Joe’s. 🙂 But lately I see it on menus at restaurants all the time! Yeah, the fact that leftover risotto kind of solidifies is why it makes great arancini–you don’t even have to add anything to it to get it to bind together! Any recipe that helps me use up leftovers is a welcome addition to my house. Thanks for posting this!!! This is totally the best way to use leftover risotto! I have never heard of Arancini until today. This looks amazing and dairy-free too! We must have really hearty appetites because we rarely have more than one serving of risotto left over. I can’t wait to try this (and your lemon risotto recipe too)! Well, they have dairy if the risotto you use to make them has dairy in it. But I think you can make risotto with just broth. I’ve also seen risotto made with asparagus puree, which would probably add to the creaminess. I’ve never used dairy in my risotto – always broth and olive oil. Look me eating vegan when I didn’t have to! I don’t know what I was thinking – I use parmesan in my risotto. Although I’ve forgotten it before and it’s still really good! Love anything baked and less fat than frying. We fry way too much stuff at this house. This recipe looks so good. Thanks for sharing. I’m always scared to fry! Even when I put more than a tablespoon of oil in a pan, I somehow end up burning myself or getting oil spatters all over my clothes. Oooo, I am so glad I just discovered your fantastic blog 🙂 I have a vegetarian blog too, and am so happy to find another veggie blogger ^_^ This recipe looks fantastic! I first had arancini in NYC last fall and I’m addicted. A baked version is perfect, as I hate frying. *hah* Great post! Yay, thanks for stopping by! I am always looking for new veggie blogs to add to my RSS feed, so I’m excited to check yours out. 🙂 And yes, arancini is totally addictive! Thanks for the shout out chica 😀 I’m so behind on my Google reader your post slipped by me! Hi! I just wanted to let you know, I made these for New Year’s Eve after my husband gave me the impossible task of choosing an appetizer that was not deep fried and did not contain artichokes, shrimp or excessive amounts of cheese. He loves risotto so this seemed like a good idea. I was hugely impressed with how these came out … I used panko as you suggested and I don’t think I’ve ever had something oven-baked come out with such a great, crispy texture. They really didn’t suffer from not having been deep fried. I cooked them on a wire rack so I got that nice crispy texture all over. They were perfect and hubby was happy. I might actually try doing oven-fried chicken the same way. Thanks so much for this recipe, it was the answer to a huge problem (there is almost no such thing as an appetizer that isn’t cheesy, deep fried, or made with shrimp/artichokes)! I’m so glad they turned out well! And not too cheesy either. 😉 I really think panko is the key to oven-baking things that are normally deep fried. Regular bread crumbs just don’t get as crispy. I made your risotto recipe as a trial run for Easter and it was fantastic! I made this tripe with the leftovers and it is amazing too! I even used gf AP flour and gf panko and it still tastes great! I still have lots of leftovers (!!) so I’m going to use the rest to make this recipe with regular flour and panko. Thanks for 2 wonderful recipes!! Ha! Recipe definitely makes more sense than tripe. 😉 I’m so glad you enjoyed both of the recipes–I hope your Easter guests like the risotto too! I made these and they tasted great. I am thinking of using them for a party. What, if any, work-ahead steps could I take? Do you think if I rolled them, floured, egged and breaded them the night before they’d be a soggy mess by the time I put them in the oven 24hrs later? My boyfriend always makes enough risotto to feed a large family, even though there are only the two of us. So. Just made these today from leftover mushroom risotto. AMAZING! New favorite thing. I’m so glad I found this page! Thank you.